The MVR-300 provides continuous refrigerant detection within occupied spaces. The MVR300 is ideal for integration with VRF/VRV (Variable Refrigerant Flow/Variable Refrigerant Volume) systems. The monitor ensures the safety of occupants, in addition to enhancing the effectiveness and energy efficiency of the HVAC system, minimizing potential environmental impact from leaking gases and helping to comply with regulations such as EN378:2016 and ASHRAE 15:2013. The MVR-300 identifies affected rooms and enables the HVAC system to isolate the leak, so that other rooms remain unaffected while the risks of a refrigerant leak are mitigated. The MVR-300 communicates the detection of a refrigerant leak by Modbus or relay contacts, and it can be integrated with HVAC control systems to automatically isolate a leak. In addition, room occupants can be audibly and visibly alerted to the presence of leaking refrigerant. 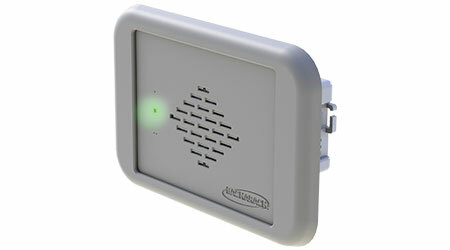 The MVR-300 installs in a standard 2-gang electrical back box so it sits flush to the wall. Its low profile, neutral design blends into typical room décor, making the instrument unobtrusive. A range of communications options allow for alarms to be centralized into a building management system or other control system.